As it turns out, it was not an uncountable number of conjectures. With digital assistance, I was able to tabulate them. I was curious about the hedge words – qualifiers – that Robert Ayres relied upon throughout his text. Their existence isn’t surprising in a speculative effort of this nature, but the weasels were so pervasive that I decided to do some stylometric analysis, following the example of The New Oxford Shakespeare. I too employed sophisticated data-mining and visualisation software: Acrobat and Excel. than Björk can fit into one song. I left anagram/anagrams off of the chart, but I counted those words as well: 244 occurrences. I can’t tell you how many actual anagrams are in the document. Many. I make it a point to avoid those things, they give me a megrim. Here is a sample paragraph from page 302, which I chose by closing my eyes, scrolling randomly up and down several times, and pointing at the screen. 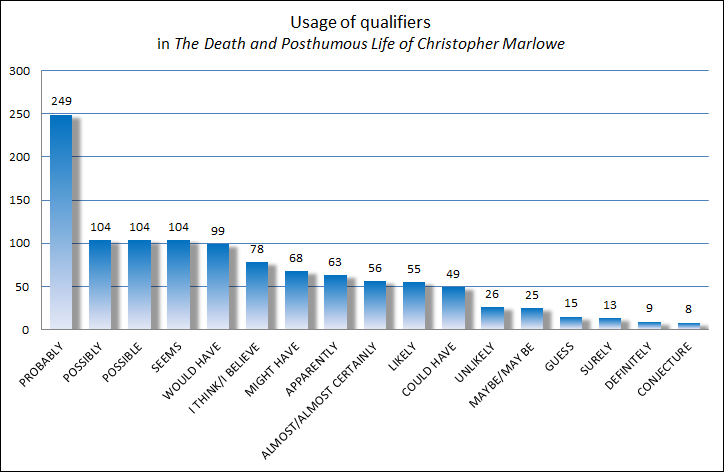 It describes the trip across the Channel that Ayres has Marlowe making, following his faked death at Deptford Strand. The Salamander probably arrived in Calais on June 4, 1593, a day later than originally planned. Marlowe was probably traveling under the name “LeDoux”, since his previous work-names, “Colerdin” and “Gifford” had been blown several years earlier and were no longer safe. LeDoux is a name he probably borrowed from a childhood Huguenot refugee acquaintance of his in Canterbury. He almost certainly used that name later. Four sentences, four verbs, four hedges: the paragraph is a substanceless cloud of wishful thinking. Ayres is a retired scientist, so he should know that each of his 249 repetitions of probably is supposed to mean, at a minimum, with a likelihood of greater than 50%, and more generally, without substantial doubt. It does not mean let’s pretend. Advice to anyone who writes: if this is what your nonfiction looks like, rewrite it as fiction, because that’s what it is. Speaking of fiction – the document includes a digression, Ayres’s own term for the ten-page hatchet job on my character that begins on page 134. I’m unfortunately accustomed to such ad hominem abuse, though this stands out among my collection of hatchets. The hedges and qualifiers vanish when the creative writing imagines me rather than Marlowe. If only the author was half so certain about his protagonist. I would normally have ignored Ayres’s hit-him-while-he’s-dead diatribe as not being worth a response, however one bit of his bad form did get under my skin, which I do not abide: his naughty-schoolboy cheek, repeatedly calling me Ned. That is a name of familiarity for my friends to use.